A Section of Plate 3 from the Papyrus of Ani. Plate 3 contains half of the first (and longer) instance of chapter 30B in Ani's Book of the Dead, which is titled: Chapter for not letting Ani's heart create opposition against him in the God's Domain. 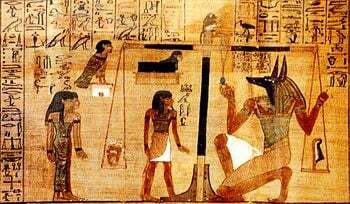 This vignette shows Ani's heart being weighed against a feather of Maat (Truth, Rightful Order). Thoth (baboon) is overseeing, and Anubis (Jackal headed god) is the "Guardian of the Scales." The three standing figures to the left are the three aspects of fate. The rectangular stone with a woman's head is one of the three aspects of fate. Ani's Ba (the human headed bird and one aspect of the soul) is perched on a shrine and is looking over the event which will determine his fate. This vignette is similar to vignettes that would be found associated with chapter 125 of the Book of the Dead, and an abbreviated version is, in fact, found in chapter 125 of the Papyrus of Ani. The Book of the Dead is the common name for the ancient Egyptian funerary text known as The Book of Coming [or Going] Forth By Day. This text was both a description of the ancient Egyptian conception of the afterlife and a collection of hymns, spells, and instructions to allow the deceased to pass through obstacles contained therein. The Book of the Dead's second raison d'être (as an instructional text of sorts) lent it a sacramental function, as papyrus copies of it were often placed in the coffins or burial chambers of the deceased, with the intention that the dead could use them upon their respective resurrections. One component of the text that has received extensive scholarly attention is a listing of the so-called "Negative Confessions," a moral litany that has been used to compare the ethical codes of the Ancient Egyptians to those of the early Jewish people. The name "Book of the Dead" itself was the invention of the German Egyptologist Karl Richard Lepsius, who published a selection of the texts in 1842. When first discovered, the Book of the Dead was seen as an Egyptian analog of the Bible. However, unlike the Judeo-Christian text, the Book of the Dead was not considered by the ancient Egyptians to be the product of divine revelation, which allowed its contents to evolve in response to changes in the religious climate. The Book of the Dead was thus the result of a long process of theological, cosmological and ethical development, with themes derived from such diverse sources as the Pyramid texts of the Old Kingdom and the Coffin Texts of the Middle Kingdom. For instance, about one-third of the chapters in the Book of the Dead are attested to in the Coffin Texts. In a similar manner, the Book of the Dead itself was adapted into the Book of Breathing (a syncretistic funerary text) in the Late Period, but remained popular in its own right until the Roman occupation. 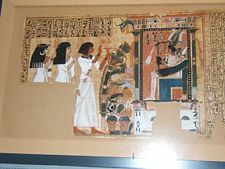 The first part of the Book of the Dead is typically a hymn to the Great God (usually Ra, Atum, or Horus), with the god Osiris representing the needs and concerns of the deceased human. This is followed by the most critical moment in the book, the "weighing of the heart," a symbolic judgment of the person's character in which the weight of their heart is compared to a feather of Ma'at (the symbol of ethical action). If the deceased's heart is lighter than the feather, they are judged worthy and may proceed into the company of the gods. If the deceased is found unworthy, their hearts are devoured by the monster Ammit, after which point they either wink out of existence or are condemned to a shadowy existence between worlds. This utterance of yours is true. The vindicated Osiris-[name] is straightforward, he has no sin, there is no accusation against him before us, Ammit shall not be permitted to have power over him. Let there be given to him the offerings which are issued in the presence of Osiris, and may a grant of land be established in the Field of Offerings as for the followers of Horus. The third gate: the name of its gatekeeper is 'One who eats the Putrefaction of his Posterior'; the name of its guardian is 'Alert of Face'; the name of the announcer in it is 'Gateway'. Knowledge "socialized" the deceased in a realm that was conceived of as a community. It identified him to those in the afterlife as one of them and lent him power over demons who could be dangerous to him. Knowledge of the netherworld conferred a nether-worldly identity on him as a "holy god in the following of Thoth," the god who was the guide of souls and the learned one, the quintessential knowing one. Sample of a Book of the Dead of the scribe Nebqed, around 1300 B.C.E. O Wide-of-stride who comes from On: I have not done evil. O Flame-grasper who comes from Kheraha: I have not robbed. O Long-nosed who comes from Khmun: I have not coveted. O Shadow-eater who comes from the cave: I have not stolen. The content of some of the statements of denial or the 'negative confession' has led some scholars to hypothesize that they may be the basis for the Biblical Ten Commandments. This being said, Zivie-Coche argues that the traditional description of these texts as "confessions" is somewhat misleading, as "here it was not a matter of a repentant sinner confessing all his sins so that he might be pardoned, but rather a matter of declaring with the confidence of an innocent person that the list of sins against Maat, which was codified and conceived of as exhaustive, had not been committed by him." The earliest known versions date from the sixteenth century B.C.E. during the New Kingdom, eighteenth Dynasty (ca. 1550 - 1292 B.C.E.). It partly incorporated two previous collections of Egyptian religious literature, known as the Coffin Texts (ca. 2000 B.C.E.) and the Pyramid Texts (ca. 2600 B.C.E. - 2300 B.C.E. ), both of which were eventually superseded by the Book of the Dead. The Book of the Dead for Scribe Ani, the Papyrus of Ani, was originally 78 ft (28 m), and was separated into thirty seven sheets at appropriate chapter and topical divisions. The text was often individualized for the deceased person, so no two copies contain the same text. However, "book" versions containing similar features are generally categorized into four main divisions – the Heliopolitan version, which was edited by the priests of the college of Annu (used from the 5th to the 11th dynasty and on walls of tombs until about 200); the Theban version, which contained hieroglyphics only (20th to the 28th dynasty); a hieroglyphic and hieratic character version, closely related to the Theban version, which had no fixed order of chapters (used mainly in the 20th dynasty); and the Saite version which has strict order (used after the 26th dynasty). Chapters 1-16 The deceased enters the tomb, descends to the underworld, and the body regains its powers of movement and speech. Chapters 17-63 Explanation of the mythic origin of the gods and places, the deceased are made to live again so that they may arise, reborn, with the morning sun. Chapters 64-129 The deceased travels across the sky in the sun bark as one of the blessed dead. In the evening, the deceased travels to the underworld to appear before Osiris. Chapters 130-189 Having been vindicated, the deceased assumes power in the universe as one of the gods. This section also includes assorted chapters on protective amulets, provision of food, and important places. There are 192 unique chapters known, and no single papyrus contains all known chapters. Books were often prefabricated in funerary workshops, with spaces being left for the name of the deceased to be written in later. They are often the work of several different scribes and artists whose work was literally pasted together. The cost of a typical book might be equivalent to half a year's salary of a laborer, so the purchase would be planned well in advance of the person's death. The blank papyrus used for the scroll often constituted the major cost of the work, so papyrus was often reused. ↑ "Feature story: The Book of the Dead" by Caroline Seawright. Retrieved December 14, 2007. See also: Jan Assmann. In search for God in ancient Egypt, Translated by David Lorton. (Ithaca: Cornell University Press, 2001), 67, who notes the copies of the Book of the Dead "were placed in the tombs of the ordinary dead to provide them with the knowledge they needed" to safely traverse the afterlife. ↑ Geraldine Pinch. Handbook of Egyptian mythology. (Santa Barbara, CA: ABC-CLIO, 2002), 42. ↑ Henri Frankfort. Ancient Egyptian Religion. (New York: Harper Torchbooks, 1961), 117, 119-120. ↑ Zivie-Coche, 180-181; Richard H. Wilkinson. The Complete Gods and Goddesses of Ancient Egypt. (London: Thames and Hudson, 2003), 150-152; E. A. Wallis Budge. The gods of the Egyptians; or, Studies in Egyptian mythology. A Study in Two Volumes: Vol. I, (New York: Dover Publications, 1969), 418-421. ↑ B. A. Robinson, The Ten Commandments (a.k.a. The Decalogue): The possible origin of the Ten Commandments. www.religioustolerance.org  accessdate 2007-08-30. ↑ See Goelet ; S. Quirke, "Owners of Funerary Papyri in the British Museum" British Museum Occasional Papers 92 (1993), 18-19. ↑ See Goelet ; Anthony Leahy, "More Fragments of the Book of the Dead of Padinemty," The Journal of Egyptian Archaeology 85 (1999), 230-232. Allen, Thomas George. The Egyptian Book of the Dead: Documents in the Oriental Institute Museum at the University of Chicago. Chicago: University of Chicago Press, 1960. Allen, Thomas George. The Book of the Dead or Going Forth by Day. Ideas of the Ancient Egyptians Concerning the Hereafter as Expressed in Their Own Terms. SAOC Vol. 37. Chicago: University of Chicago Press, 1974. Budge, E. A. Wallis (translator). The Rosetta Stone. 1893, 1905. Accessed at sacred-texts.com. Dennis, James Teackle (translator). The Burden of Isis. 1910. Accessed at sacred-texts.com. Dunand, Françoise and Zivie-Coche, Christiane. Gods and men in Egypt: 3000 B.C.E. to 395 C.E. Translated from the French by David Lorton. Ithaca, NY: Cornell University Press, 2004. ISBN 080144165X. Faulkner, Raymond O. The Egyptian Book of the Dead, The Book of Going forth by Day. The First Authentic Presentation of the Complete Papyrus of Ani, Translated by Raymond Faulkner. Edited by Eva von Dassow, with contributions by Carol Andrews and Ogden Goelet. San Francisco: Chronicle Books, 1994. ISBN 0811807673. Goelet, Ogden. A Commentary on the Corpus of Literature and Tradition which constitutes the Book of Going Forth By Day. San Francisco: Chronicle Books, 1998. Meeks, Dimitri and Meeks-Favard, Christine. Daily life of the Egyptian gods, Translated from the French by G.M. Goshgarian. Ithaca, NY: Cornell University Press, 1996. ISBN 0801431158. Budge, E. A. Wallis, "Book of the Dead, The Papyrus of Ani." Online Readable Text, with several images and reproductions of Egyptian papyri. History of "Egyptian Book of the Dead"
This page was last modified on 20 September 2017, at 19:54.